Numerous field and laboratory observations indicate how multiple factors influence the dynamics of polar ice masses. These include the large-scale flow pattern, stress- magnitude, temperature and ice microstructure. Data obtained from polar ice cores, and their corresponding boreholes, provides a valuable resource for evaluating the flow relations for ice used in ice sheet models. 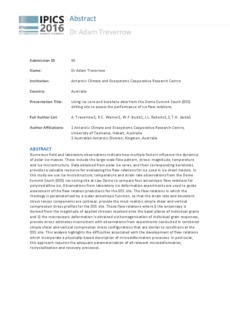 In this study we use ice microstructure, temperature and strain rate observations from the Dome Summit South (DSS) ice-coring site at Law Dome to compare four anisotropic flow relations for polycrystalline ice. Observations from laboratory ice deformation experiments are used to guide assessment of the flow relation predictions for the DSS site. The flow relations in which the rheology is parameterised by a scalar anisotropic function, so that the strain rate and deviatoric stress tensor components are collinear, provide the most realistic simple shear and vertical compression stress profiles for the DSS site. Those flow relations where i) the anisotropy is derived from the magnitude of applied stresses resolved onto the basal planes of individual grains and ii) the macroscopic deformation is obtained via homogenisation of individual grain responses, provide stress estimates inconsistent with observations from experiments conducted in combined simple shear and vertical compression stress configurations that are similar to conditions at the DSS site. This analysis highlights the difficulties associated with the development of flow relations which incorporate a physically-based description of microdeformation processes. In particular, this approach requires the adequate parameterisation of all relevant microdeformation, recrystallisation and recovery processes.